It’s been more than a year since we last looked at bassinets. To update this guide, we brought in three new models, and considered two updated designs from our last guide. In the end, we selected a new favorite. A newborn baby will sleep for as much as 16 hours per day during their first few months of life. That’s over a thousand hours of sleep time during the first three months alone, not to mention the amount of time spent soothing them back into that slumber. Bassinets are smaller than cribs and easier to move around the house, making it easy to set one up in whatever room you’re in. Having your baby nearby can help provide peace of mind for stressed out parents that keep wondering what their baby is up to during a nap. We considered twelve bassinets over the course of 26 hours of research and testing. These models range in price from $65 up to $400. After all our research, the Halo Bassinest Swivel Sleeper-Essentia Series came out on top with a clever design and loads of useful features. Who Should Buy a Bassinet? Parents who want a safe place for their baby to sleep that’s smaller than a crib, and designed for a newborn baby. Bassinets are stand-alone furniture (unlike co-sleepers which are designed to attach to your bed), and are great for parents who want to bring their baby into their bedroom or home office for the first few months of the baby’s life to more closely monitor their sleeping habits. Doing this also makes nighttime feedings and diaper changes easier. Using a bassinet is also recommended by the American Academy of Pediatrics. They advise parents to keep infants in the same room as the parent to reduce the risk of SIDS. When recovering from the delivery of the baby (especially from a C-section) the lower height will make it easier to get the baby in and out. For starters, let’s nail down what a bassinet is. Bassinets are smaller than most cribs and have a fixed-height position where the baby sleeps. This differs from a crib, which has multiple levels for growing babies. Most bassinets include a firm pad or mattress that’s specifically shaped for it, due to their different sizes. Some of them fold, some will rock, and others will even vibrate if you want them to. Bassinets fit infants until they have gained the upper body strength required to push themselves up. Some will include a weight limit, which is usually between 15 and 25 lbs. A good bassinet should have an elevated sleeping area that’s easy to reach, a sturdy frame, and be large enough for growing babies. You’ll want a firm mattress—nothing soft or frilly on the inside of the bassinet that could become a suffocation hazard. Any other features, like a canopy, or apron should also be out of reach or securely fastened to the shell of the bassinet to avoid the same hazards. Some bonus features include an area for storage, a rocking mechanism, or the option to put the shell into motion. We interviewed Dr. Michael H. Goodstein, a certified member of the American Academy of Pediatrics, and Attending Neonatologist at York Hospital to get some answers on sleep safety. In the meantime, make sure that if you choose a rocking bassinet—commonly called a cradle—that it moves only slightly. You don’t want anything with an extra-long arc or fast motions, as they can gradually move the baby towards the sides of the cot. Avoid using aftermarket or third-party parts. These include new mattresses, canopies, and anything else that wasn’t intended for use with your bassinet. Doing all of the above can prevent or eliminate the risk for injury and make your baby’s sleeping environment safer. We originally narrowed down the field to three candidates based on price, features, and online ratings. Our hands-on testing led us to a final selection. In order to update the guide, we selected 2 new bassinets to compare against our original pick, choosing to evaluate their design, usefulness and usability. Once set up, we enlisted the help of two parents: one parent was 5 feet tall; the other was 5’8”. Their baby was 14 lbs, 24-inches tall, and was just over three months old. We had them place their baby in and out of the bassinet from a standing height, as well as from a seated position. After that, we had our parents move the bassinet around, and observed if they had any trouble placing it next to their bedside. After researching and testing, we decided to update our ultimate choice to the Halo Bassinest Swivel Sleeper-Essentia Series ($200). We evaluated the Bassinest when it first hit the market; since then the product has been updated. For starters, there are now two different models: the Essentia and the Primera. Our choice lacks the electronics of the Primera, but also comes in at a lower price. We feel that you can spend the difference in price on a great sound machine, or apps to produce similar results to the nightlight or sleep timers. The other major feature it’s lacking is the vibrating motor. This received mixed feedback from parents, so we feel that you won’t miss it. The side-wall closest to the bed can be pressed down and locked into place, making it easier for parents to reach their baby. This is especially important for mothers recovering from C-section deliveries, reducing the amount of stress and discomfort involved with lifting a baby. The walls are also lined with mesh, providing a breathable and safe sleep environment. 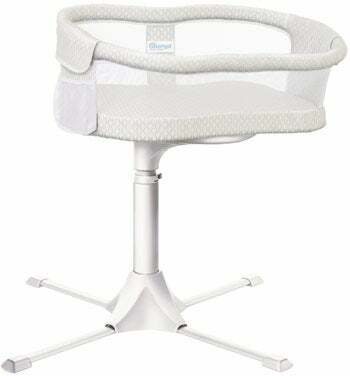 The height is adjustable from 22- to 34-inches high and the actual bassinest swivels 360 degrees. This makes it easy to glide the bassinet back and forth around a 360 degree circle at a convenient height. Concerned about the stability of a rotating bassinet? The product weighs a whopping 50 pounds. The base is extremely sturdy, and as mentioned, the bassinet is height adjustable. Due to the shape of the base, with four legs, you can position the bassinest as close as you need it to be. One gripe that some reviewers have with our pick is the weight of the product. Yes, this bassinet is heavy, but it helps ensure that the product will work without any worries about stability and tipping. We feel it’s worth the trade-off, even if you move the Essentia from room to room. We still like our original pick from last year, the Babyletto Bowery Bassinet. At $130, it’s a sturdy, wood-frame bassinet. It’s made of sustainable New Zealand pine, and it can be repurposed as a toy box once your baby has outgrown it. It has a thoughtful design, starting with a central cross beam, and two x-shaped end pieces. This way, a parent can walk up to the side of it without any impediments. The Bowery won’t have the adjustable height, push-down sides or low-profile frame of the Essentia, but it does cover the basics at a lower price point than our top pick. Arms Reach Mini Co-Sleeper Bassinet—Takes ideas from bassinets and co-sleepers and tries to combine them into one product. Lots of plastic and rough fabric. BabyBjorn Harmony Cradle—While it looks great on paper, the price doesn’t even include the canopy. With everything included, your price is over $350. Needless to say, it’s very expensive given its very basic features and limited usage period. Baby Home Dream Cot— Only fits children up to 20 lbs. Even though it’s touted as a travel crib, disassembling and putting it back together are both rather complicated. Brica Fold and Go—Good for travel, but not for everyday use do its smaller size and lack of support. Chicco Lullago Travel Crib—Smaller dimensions won’t fit babies as long as other bassinets, and folding is a multi-step process. Monte Design Ninna Nanna—While this bassinet looks great, it doesn’t do anything special given the higher price point. Nuna Sena Mini—Modern take on the pack ‘n play in a mini size. Heavier than other travel bassinets and the bassinet setting is closer to the ground than other options. Summer Infant Bentwood Bassinet with Motion— Only fits infants until 15 lbs. Wide base makes it hard to place this next to a bed or other furniture. Fisher Price Rock ‘n Play Bassinet— Flimsy base is wide and doesn’t seem sturdy. Bassinet area is very small and the attachments could be hazardous if they became detached. Tiny Love 3-in-1 Rocker Napper— As one reviewer put it, this is neither a rocker or a napper. It just doesn’t do either that well, and it’s placed on the ground. If you opt for a bassinet with a wood frame, you’ll want to follow the same recommendations that we laid out in our Best Crib Guide. Use a lightly dampened cloth to wipe clean any dust, dirt or messes, and to avoid using any harsh cleaning agents, as they may affect the frame’s finish. Bassinet sheets can be washed according to their instructions, and if anything that gets on your mattress it should be spot treated as soon as possible. If the mattress needs to be disinfected, then use a mixture of hydrogen peroxide and water. The mattress or pad that comes with your bassinet will be firm, and on the thin side. While this might seem uncomfortable to you, a firm surface is best for the baby, and will help them sleep better. Our safe sleep expert Dr. Michael H. Goodstein advised us that the bassinet is a safety device, and not a decoration, citing advertisements and store displays that feature bassinets that are over-flowing with pillows and toys. He told us, “If you want to show your baby how much you care, put nothing but the baby in the crib.” Lastly, every product we looked at came with a warranty, most for one year. As with every baby product you purchase, be sure to register it with the manufacturer, just in case a recall occurs. Keeping your baby in the same room with you is both convenient and safe. This set-up enables you to be closer when your baby wakes up, needs to be fed, or have their diaper changed. It’s also recommended by the American Academy of Pediatrics. The Halo Bassinest Swivel Sleeper-Essentia Series offers parents a convenient and well-thought out bassinet. It’s sturdy, well constructed and is even height adjustable for your bedside.